Good price for so many pieces of rompers! OMG!!! it's a very affordable price. Grab it and don't miss it. The breast pump has a compact design, which makes it easy to hold and position on your breast. The small, lightweight base unit can easily be placed within comfortable reach for full control when pumping. For extra convenience in transport and storage, the tube simply wraps around the base unit. Easy to use on the go with batteries. 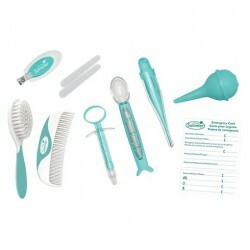 Get your baby health essentials here!! NEW LAUNCH! 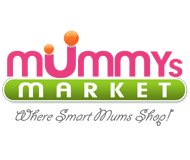 Get DUAL PROTECTION for your baby and mattress! 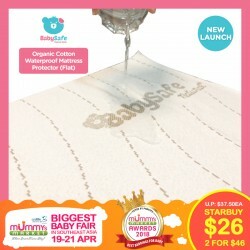 The newly launched 100% Organic Cotton Waterproof Mattress Protectors are designed to fit snugly on your baby’s cot similar to a fitted sheet or lay on top of any bedding surface to protect against fluids and dust-mites. Each protector is made with soft and plush 100% GOTS certified organic cotton jacquard. - For heavy wetters, it is advisable to place 2 layers for better protection. - Wash before you use for most effective absorbency. 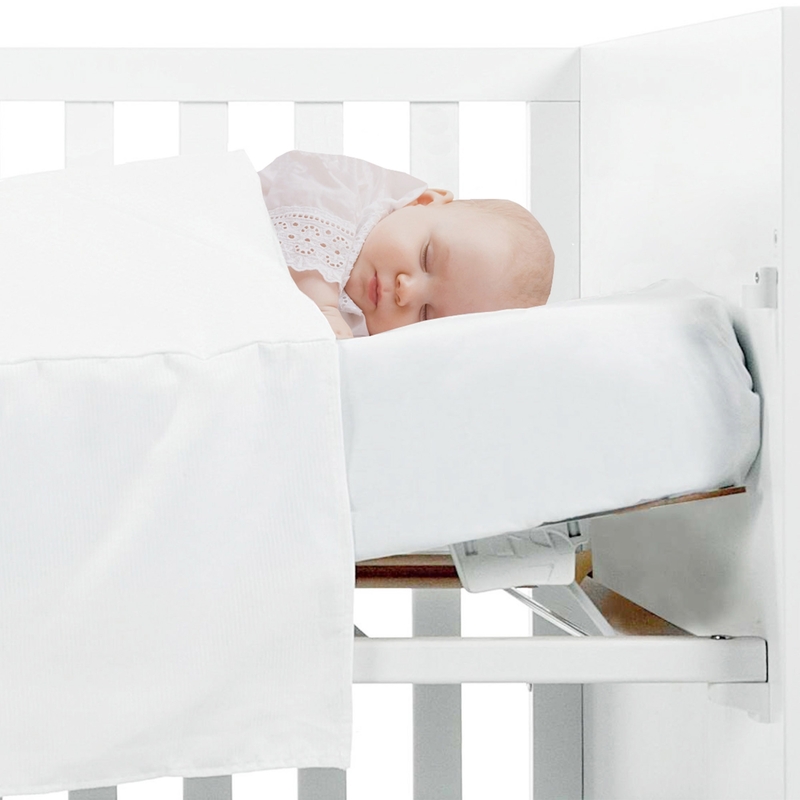 (1) Fitted crib sheet is elastic at the 4 corners and fits up to 28 x 56 x 3 inches. 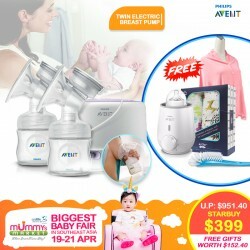 The breast pump has a unique design, so your milk flows directly from your breast into the bottle, even when you are sitting up straight. 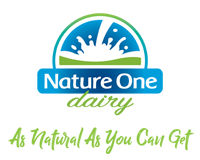 This means you can sit more comfortably when pumping: no need for you to lean forward to make sure all your milk ends up in the bottle. Sitting comfortably and being relaxed when pumping, naturally helps your milk to flow more easily. The Touring is suitable from birth up to 15 kgs as it goes from a lie-flat pram for newborns to sit-up pushchair for toddlers. Touring reversible seat promise you to explore the world together with your love baby. Adjustable canopy keeps your baby away from the sun’s harsh rays and maximizes airflow. Magnetic peek-a-boo window and zip-off window to maximize airflow and allow you to see your child. Swivel and removable front bumper makes it easy to place baby in and out. Easy Conversion to crib mode or seat unit. Reverse and recline the seat to grow with baby's changing size. The suspension swivel front wheels ensures a smooth ride and improves maneuverability. With a large open storage basket and four mesh pockets, you can easily take your baby's necessities with you. The lightweight frame with quick-fold design allow you to fold the jogger in seconds and compactly. 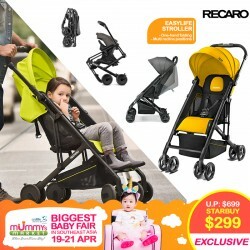 Recaro's Easylife stroller is something that's very relevant to the Singapore life, with its modern and sleek design. 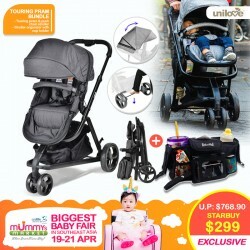 Its wheels are rugged, and the suspension on each wheel allows a comfy ride for baby. An added bonus is the extremely spacious basket that covers the entire underside of the stroller that can fit quite a few bags there. Likewise, their seat is deep and spacious, with ample amounts of padding and can support a max weight of 17.5kg. The new travel system & perfect pushchair from birth onwards!!! With a smart one-hand fold, compact folding size, a large shopping basket, fully suspended wheels and a push-push brake system – the Citylife meets the highest standards in terms of comfort, quality and versatility. VERSATILE!! Plus it's super easy to manoeuvre too! Very practical, easy-to-fold, wide, deep, well-padded seat, is easy to recline, adjustable footrest and comes with a large hood for good shade! 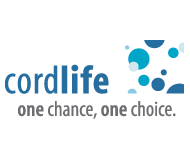 If you need a stroller that is comfortable, practical and functional to use every day and will last your child from birth to toddlerhood, then the Recaro Citylife is for you! Autumnz Moulded Maternity/Nursing Bra is gorgeously comfortable giving full support during your maternity and your nursing needs. It has smooth and moulded seamless cups that offer you a seamless appearance under tight clothing. It is not a generic bra but instead tailored specifically to each mum’s bust size and circumference to ensure maximum fit and comfort. 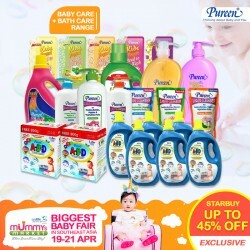 FULL RANGE of Pureen Baby Care & Bath Care Products!! WOW!!! all Up to 45% OFF! Time to stock up to save save save! Grab them at Booth G33! 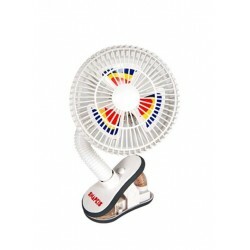 Snapkis Portable Fan keeps your baby cool, a great accessory to accompany your child on hot or sunny days. 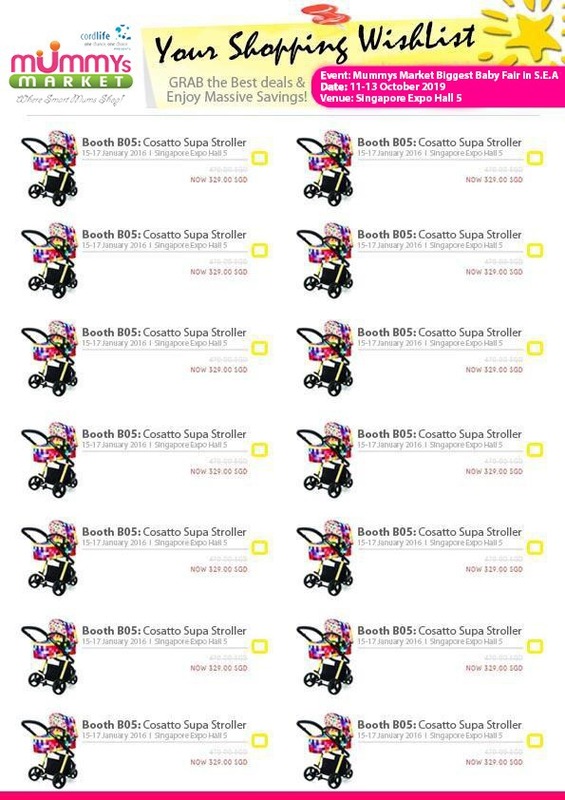 It attaches easily to stroller and other surfaces. 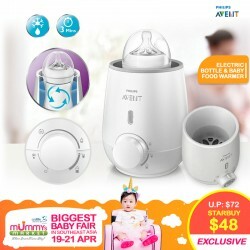 Comes with a fan cover to protect your baby’s small fingers and a flexible neck for easy positioning. Elegant, modern and ideal in any environment thanks to its color and illustration. Includes mosquito net and mattress with cover. Easy transport thanks to its reduced folding and carrying bag. Sides of net to keep an eye on the baby at all times. 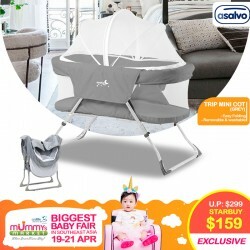 · Includes: mosquito net with zipper, padded base and carrying bag. Let your baby get a good night's rest in this crib!! The ONLY UNIQUE Cot in the market with a Sleep Relax System! Tilt the mattress to 2 different positions! SwaddleMe helps you and your baby get a good night's sleep by recreating the security and familiarity of the womb that your baby craves in the first few months of life. Soft fabric SwaddleMe wings fasten and readjust securely for the best adjustability and fit. 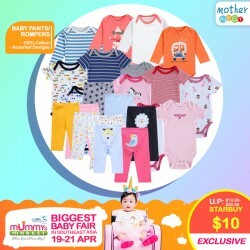 The cozy fit helps your baby to rest more calmly by preventing the startle reflex that can wake your infant. 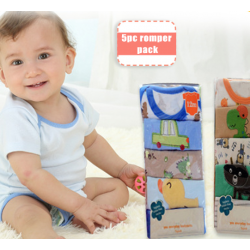 Simply pop open the leg pouch to quickly change baby's diaper without unswaddling. Small/Medium size intended for infants 7-14 lbs., up to 26"
Super Cute Rompers for your Newborn! Made from 100% Cotton! 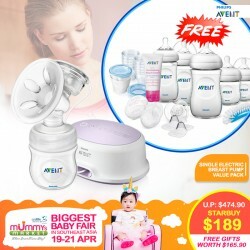 More Durable & Comfortable for your baby's skin! Breast pads can help a mom stay dry and comfortable if she experiences leaking pregnancy in pregnancy or during breastfeeding. 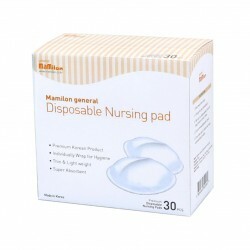 Mamilon Breastpads from Korea is designed with good absorption for mother's comfort.